Here we are! Time for another Drunken Stampers challenge...time is flying by! 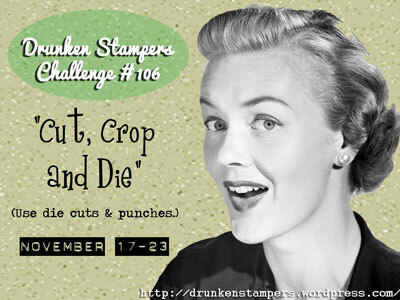 This week's challenge is "Cut, Crop and Die," be sure to visit the DRUNKEN STAMPERS BLOG for all the details on this challenge and to show Team Flirtini some love!! I am still loving the inlaid embossing technique as you can see and the square lattice embossing folder from Stampin' Up is just perfect for this technique. I love this!! Love the quilted look! !